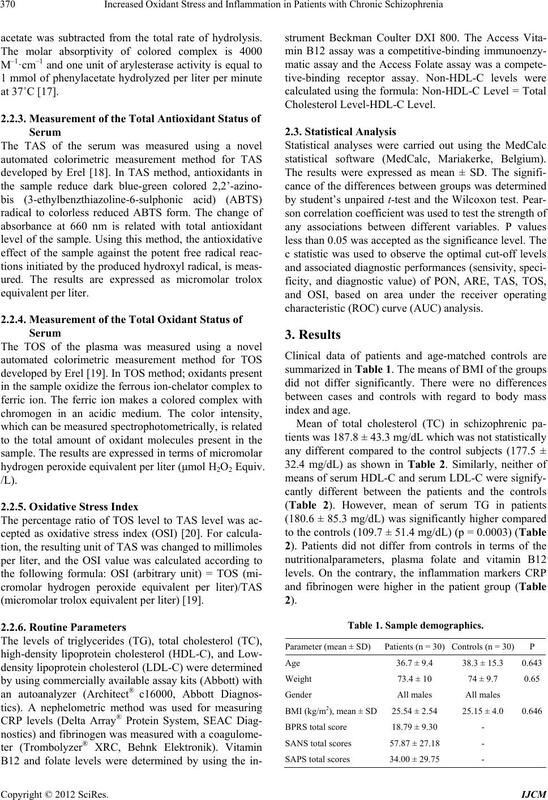 plasma total antioxidant status (TAS) and total oxidant status (TOS), oxidative stress index(OSI) in both groups. most important antioxidant defence systems in plasma. gation, treating physician reports, and medical records. severe medical conditions; and 3) informed consent. and ARE enzyme activities and TOS and TAS levels. lyzed per liter per minute at 37˚C . acetate was subtracted from the total rate of hydrolysis. hydrogen peroxide equivalent per liter (μmol H2O2 Equiv. (micromolar trolox equivalent per liter) . statistical software (MedCalc, Mariakerke, Belgium). characteristic (ROC) curve (AUC) analysis. were lower than that of TOS and OSI. significant correlation between OSI and CRP. meters in schizophrenia patients and controls. Table 4. Correlation Coefficients in schizoprenia group. schizophrenia patients compared to the controls. OSI based on ROC analysis. 0.549, respectively, and these values were lower than those of TOS (0.897) and OSI (0.878). +LR = Positive likelihood ratio; –LR = Negative likelihood ratio. pression and macrophage chemoattractant protein-1 . which on the whole, show evidences of dysregulation. understanding the pathophysiology of schizophrenia . 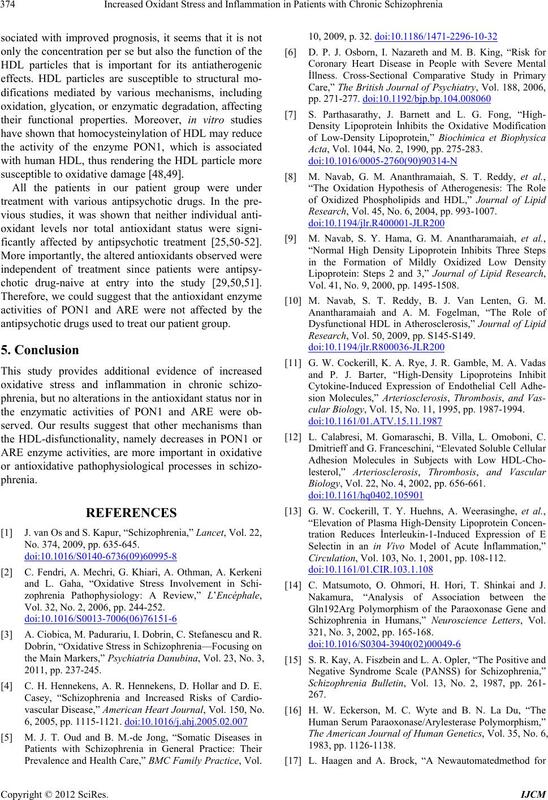 eases and affects PON1 expression and activities . modification of LDL; that is, lipid peroxidation . renia and one nonsynonymous polymorphism (Gln192Arg). cy than the 192Arg/Arg genotype . susceptible to oxidative damage [48,49]. ficantly affected by antipsychotic treatment [25,50-52]. chotic drug-naive at entry into the study [29,50,51]. antipsychotic drugs used to treat our patient group. No. 374, 2009, pp. 635-645. Vol. 32, No. 2, 2006, pp. 244-252. 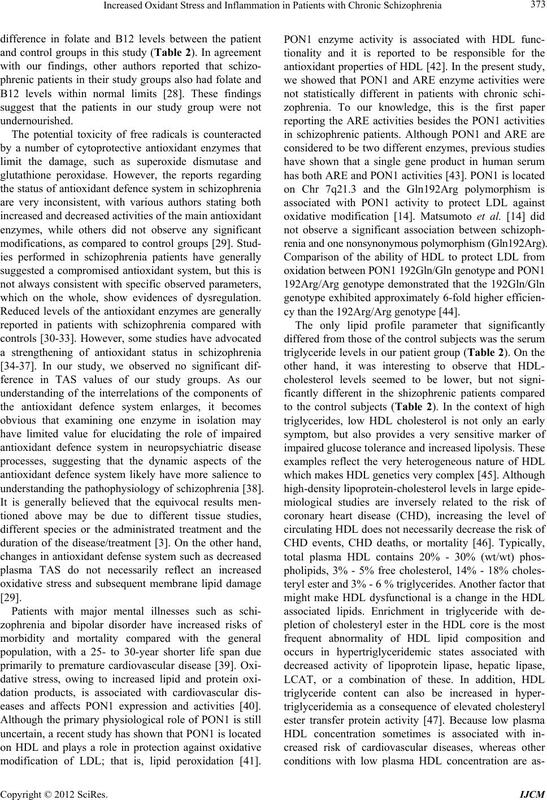 A. Ciobica, M. Padurariu, I. Dobrin, C. Stefanescu and R.
 C. H. Hennekens, A. R. Hennekens, D. Hollar and D. E.
vascular Disease,” American Heart Journal, Vol. 150, No. Prevalence and Health Care,” BMC Family Practice, Vol. Acta, Vol. 1044, No. 2, 1990, pp. 275-283. Research, Vol. 45, No. 6, 2004, pp. 993-1007. Vol. 41, No. 9, 2000, pp. 1495-1508. M. Navab, S. T. Reddy, B. J. Van Lenten, G. M.
Research, Vol. 50, 2009, pp. S145-S149. cular Biology, Vol. 15, No. 11, 1995, pp. 1987-1994. L. Calabresi, M. Gomaraschi, B. Villa, L. Omoboni, C.
Biology, Vol. 22, No. 4, 2002, pp. 656-661. Circulation, Vol. 103, No. 1, 2001, pp. 108-112. 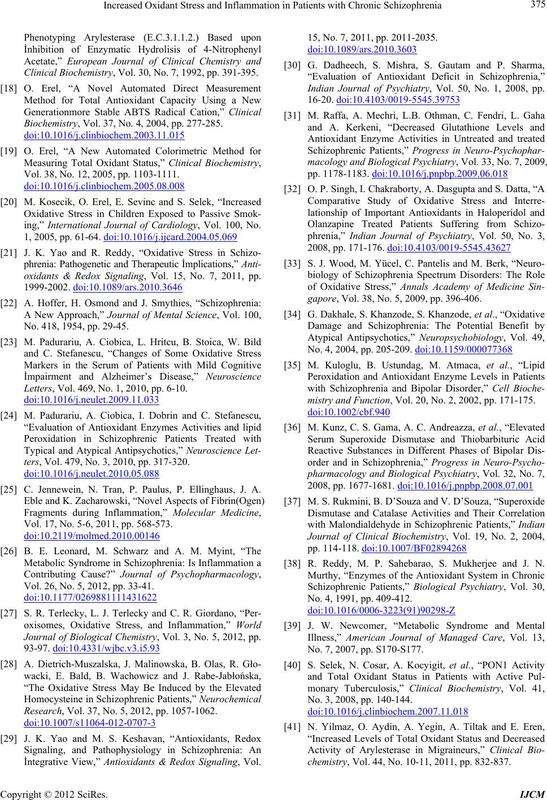 C. Matsumoto, O. Ohmori, H. Hori, T. Shinkai and J.
Schizophrenia in Humans,” Neuroscience Letters, Vol. 321, No. 3, 2002, pp. 165-168. Clinical Biochemistry, Vol. 30, No. 7, 1992, pp. 391-395. Biochemistry, Vol. 37, No. 4, 2004, pp. 277-285. Vol. 38, No. 12, 2005, pp. 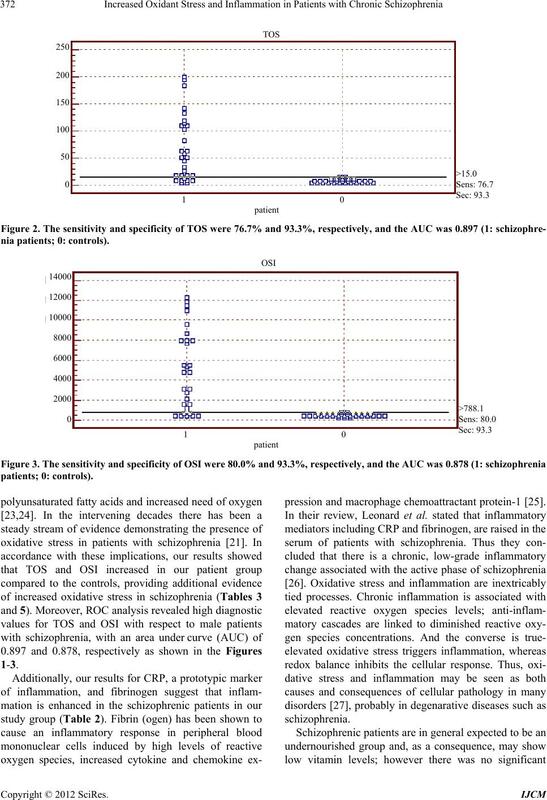 1103-1111.
ing,” International Journal of Cardiology, Vol. 100, No. oxidants & Redox Signaling, Vol. 15, No. 7, 2011, pp. No. 418, 1954, pp. 29-45.
Letters, Vol. 469, No. 1, 2010, pp. 6-10.
ters, Vol. 479, No. 3, 2010, pp. 317-320. C. Jennewein, N. Tran, P. Paulus, P. Ellinghaus, J. A.
Vol. 17, No. 5-6, 2011, pp. 568-573. Vol. 26, No. 5, 2012, pp. 33-41. Journal of Biological Chemistry, Vol. 3, No. 5, 2012, pp. Research, Vol. 37, No. 5, 2012, pp. 1057-1062. 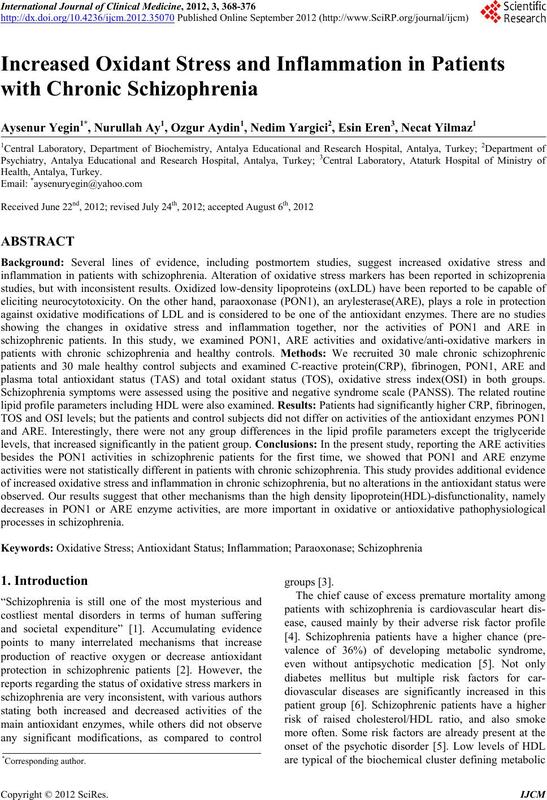 İntegrative View,” Antioxidants & Redox Signaling, Vol. 15, No. 7, 2011, pp. 2011-2035. 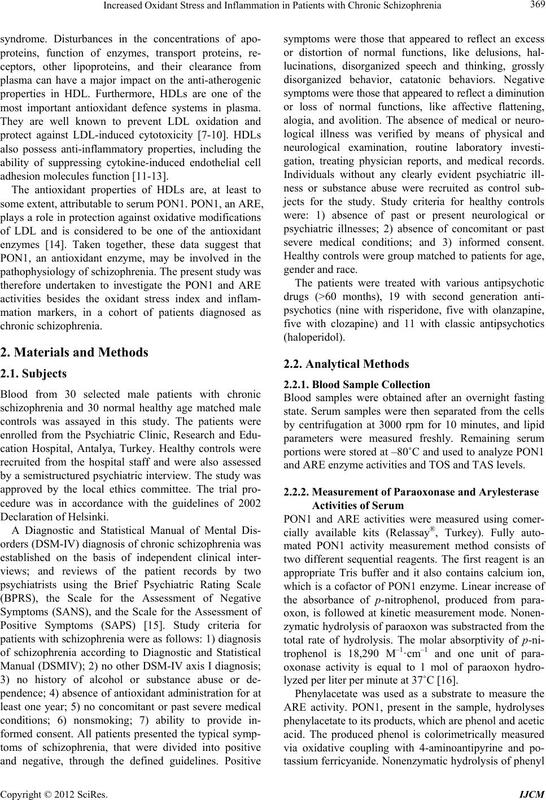 Indian Journal of Psychiatry, Vol. 50, No. 1, 2008, pp. gapore, Vol. 38, No. 5, 2009, pp. 396-406.
mistry and Function, Vol. 20, No. 2, 2002, pp. 171-175. R. Reddy, M. P. Sahebarao, S. Mukherjee and J. N.
No. 4, 1991, pp. 409-412. No. 7, 2007, pp. S170-S177. No. 3, 2008, pp. 140-144.
chemistry, Vol. 44, No. 10-11, 2011, pp. 832-837.
men,” Diabetes Care, 2011, Vol. 34, No. 2, p. e19. “Purification of Human Serum Paraoxonase/Arylesterase. B. Mackness, M. I Mackness, S. Arrol, W. Turkie and P.
No. 1, 1998, pp. 57-60. No. 3, 2009, pp. 136-160. Journal, Vol. 75, No. 7, 2011, pp. 1533-1538.
chives of Medical Science, Vol. 8, No. 1, 2012, pp. 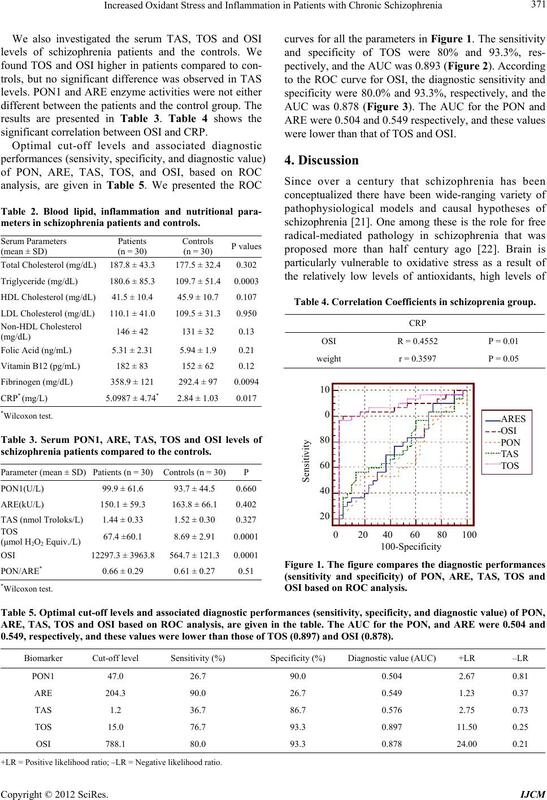 of New Biomarkers for Cardiovascular Disease,” In: B.
Artery Disease, InTech, Morn Hill, 2011, pp. 274-275.
oratory, Vol. 56, No. 11-12, 2010, pp. 513-518. 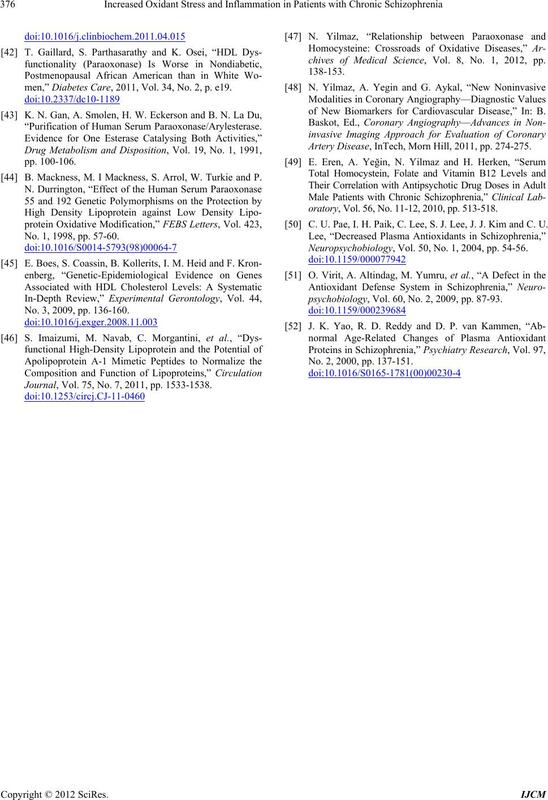 C. U. Pae, I. H. Paik, C. Lee, S. J. Lee, J. J. Kim and C. U.
Neuropsychobiology, Vol. 50, No. 1, 2004, pp. 54-56.
psychobiology, Vol. 60, No. 2, 2009, pp. 87-93. No. 2, 2000, pp. 137-151.